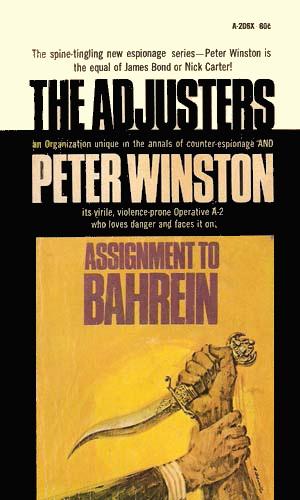 Peter Winston is an agent for the Adjusters. Shortly after graduating, he was on a subway car in New York, jobless and nearly broke, when he heard a fight break out in the next car. Three gang members were attacking a couple and were severely beating the man. Without hesitation, Winston joined in the fray and quickly and conclusively ended the skirmish though he took several knife attacks in the process. His defense of the innocent couple brought him to the attention of Lester Vandervelde, executive vice-president of the conglomerate White, Whittle, Limited, who picked up all the expenses of the resulting hospitalization and even sent him to a plush rehabilitation center. Upon release, a job offer was made. 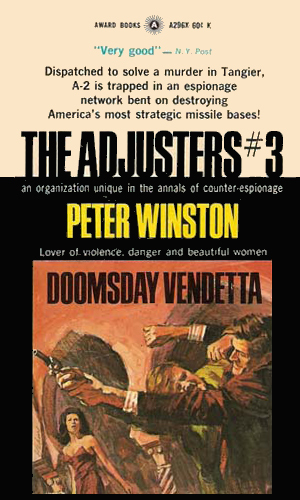 The job was in the International Adjustments Department of the corporation, a division more often called the Adjusters, hence the name of the series. The head of the Adjusters was none other than Edgar White Whittle, grandson of the two company founders and billionaire CEO of the corporation. Inside the Adjusters, however, he was codenamed A-1. Unhappy with the less-than-stellar results the Western world's Intelligence communities had produced, he created the Adjusters to handle situations he felt deserving. Winston had already worked for the Adjusters for eight years prior to the first chronicled adventure and had moved up in the ranks, due to the deaths of the three previous A-2's, until he was their foremost agent. Peter Winston stands 6'2 and weighs 195 pounds. He is 28 years of age at the start of the series (in The ABC Affair he is listed as 29 and that assignment took place one year after the first recorded mission). He is described as 'rugged in appearance - thick of hair - hard-muscled'. 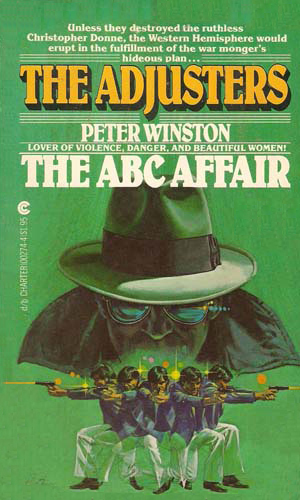 In keeping with all good men of action and adventure, Peter Winston loves the ladies and is highly successful with them. Each case has him encountering and enjoying several women, often more than once. To his credit, he treats most with considerable charm and caring. The question his boss wanted Peter Winston to answer was what was Prince Marko, brother to the Shah of the Persian Gulf island nation of Bahrein, up to. On anti-American leanings, Marko is building a unusually large 'textile processing plant', which is suspected of being something else. The ABC in the title refers to the first initials of the three highly important leaders from Brazil, Argentina, and Mexico. Heading to a vital conference in Washington, they were to have met with Whittle but were suddenly abducted. Peter Winston must track them down. 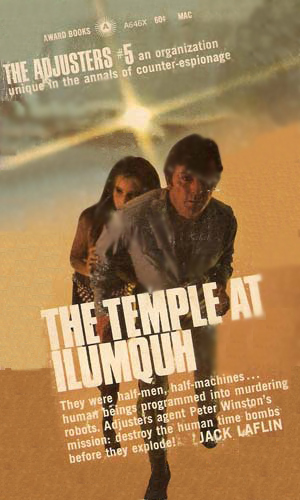 When an employee of White, Whittle, Limited heading up a project to deepen the port of Tangier is brutally murdered, Peter Winston is sent to investigate. He had hardly arrived before someone is taking shots at him. Word came out of Red China that the communist government had created a weapon capable of destroying America's nuclear arsenal still in the ground. The key to destroying the danger was in a message readable only with a specially created glass. The Adjusters had the glass, they just had to get a hold of the message. That was Peter Winston's job. In a radical break from his normal style of action, Peter Winston goes deep undercover. Learning Arabic, altering his skin color, and adapting the culture of North Yemen, he is infiltrating the region to stop the new jihad being started by a Yemeni mullah. 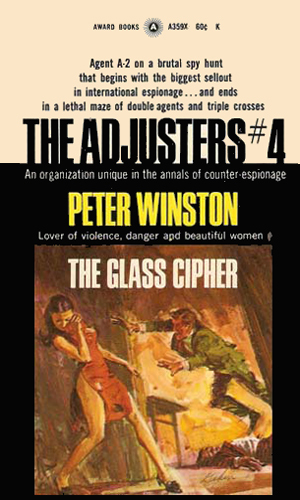 The first four books were released with only Peter Winston being listed as author, obviously a house name for the series. The fifth book was credited to JackLaflin and for a while I wrote that he might have written the others as well. Research by others, however, reveals that Paul Eiden and Jim Bowser were the two original writers, each producing two books. My thanks to my friend who told me about the site, Pulpetti and to Pat Hawk who produced an excellent source of pseudonyms which I must have. The stories are fairly interesting. The concept of an agent working for a non-governmental organization, while not unique, is rare. The missions are exciting and full of action. They are worth a read.